DURHAM (North Carolina) • Democratic front runner Hillary Clinton, buoyed by a new poll showing her soaring in the race to be president, has stepped up efforts to see her party make gains in Congress. The 68-year-old Mrs Clinton - in swing state North Carolina on Sunday after two stops in another key battleground, Pennsylvania - definitely has the momentum, with just two weeks to go before election day on Nov 8. An ABC News tracking poll published on Sunday shows Mrs Clinton leading her Republican rival Donald Trump by 12 percentage points nationally, with Mr Trump pulling just 38 per cent of the vote. Aiming to turn her edge over Mr Trump into an unbreakable lead, the former secretary of state has been reaching out to undecided Republicans and independents. She has also said she will focus on boosting Democratic candidates in House and Senate races, with control of the Republican-dominated Congress up for grabs. "We're going to be emphasising the importance of electing Democrats down the ballot," Mrs Clinton told reporters travelling with her last Saturday. On Sunday, she urged black voters in North Carolina to vote early and punish Republican office holders for supporting Mr Trump, even as Mr Trump's party increasingly concedes he is unlikely to recover in the polls. Mr Karl Rove, chief strategist of Mr George W. Bush's successful presidential campaigns, told Fox News on Sunday that he did not expect Mr Trump could pull off a comeback in the final two weeks of campaigning. "I don't see it happening," Mr Rove said. 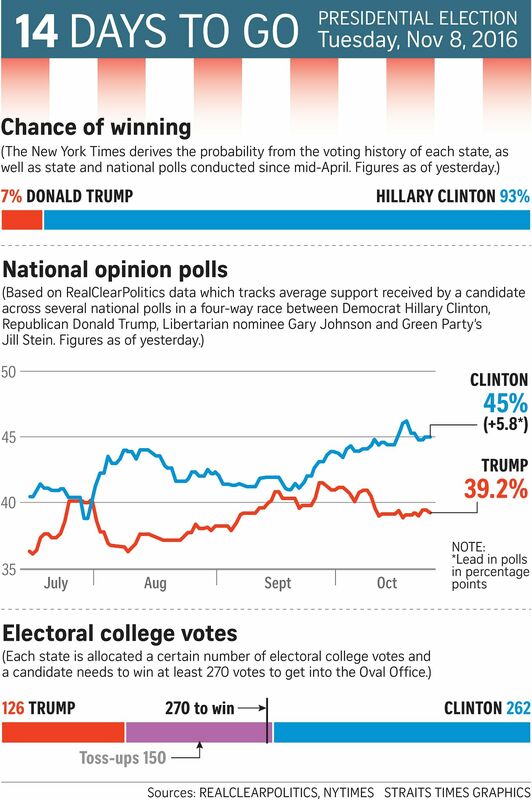 With Mr Trump's hopes so diminished, Mrs Clinton and key Republican groups have effectively pushed him aside since the final debate last Wednesday, treating him as a defeated candidate as they focus on voter turnout and the Congress battle. Mrs Clinton, who drew support from 50 per cent of voters in the ABC poll, was openly dismissive of Mr Trump over the weekend, telling reporters she no longer worried about answering his attacks. "I debated him for 41/2 hours," she said. "I don't even think about responding to him anymore." For Republicans, blunting her ability to carry other Democrats into office has become the overriding imperative in the final weeks of the race. Republicans say they will now ask voters in newly explicit terms to elect a divided government rather than giving Mrs Clinton unchecked power. Two outside groups aligned with Republicans, the US Chamber of Commerce and the Senate Leadership Fund, have begun running television commercials in Senate races implying that Mr Trump's defeat is likely and asking voters to send Republican lawmakers to Washington as a check on Mrs Clinton. Mrs Clinton's Congress battle is being backed by President Barack Obama, who has endured gridlock in Washington from Republicans who took direct aim at his vision and legacy. He has stepped in to endorse about 150 candidates in state legislative races, by far his biggest effort to bolster local Democrats since he took office. In Las Vegas on Sunday, Mr Obama campaigned for Mrs Clinton and Nevada's Democratic Senate candidate Catherine Cortez Masto, saying the Democrats have the winning hand. "You've got an ace, and you've got a jack," he said, giving in to the urge to use a blackjack metaphor in Sin City. "But you've got to make sure to turn over the card by voting. The game ends on Nov 8th!"